In the last two matches, both the Punjab's openers have scored a 90-plus score, with Rahul scoring a century. However, on both occasions, they have ended up on the losing side, thanks largely to their middle-order flop show. 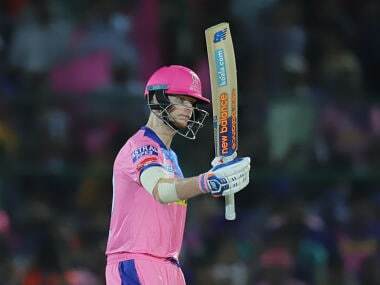 Chris Gayle scored 99 off 64 deliveries in the 28th match of IPL 2019 against Royal Challengers Bangalore (RCB). Usually, if Gayle has played that many balls in a T20 contest, he is expected to end up with a century. On one occasion, he smashed an unbeaten 175. On Saturday night, the giant run-machine adopted a rather different role and approach. His unbeaten 99-run knock helped Punjab reach a total of 173/4 at the end of 20 overs. On last night’s pitch at PCA stadium in Mohali, that score, however, was not a competitive one, not even against an RCB side, looking for its maiden victory in this season. 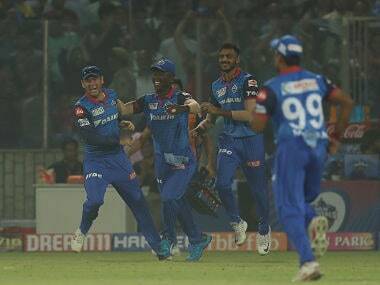 While Gayle did hit 10 fours and five sixes in the innings, he slowed down in the middle overs bowled by the spinners Yuzvendra Chahal and Moeen Ali. The RCB spin duo did a fine job of not letting Gayle cut lose against them. This season, Gayle, has been weirdly kind to spinners as his strike rate against spinners before this match was below 110. Against Chahal and Moeen, Gayle scored 17 runs in 21 balls, in contrast to 82 runs scored off pacers in 43 balls. The fact that Moeen and Chahal bowled in tandem from 7th to 14th over, brought the scoring rate down for Punjab, who were 60/0 after the end of the mandatory Powerplay. The one major reason for that to happen was the fall of wickets from one end at regular intervals. From over No 7 to 15, KXIP managed just 63 runs and lost four key wickets. The chink in the middle-order was exposed for Punjab against the guile of the RCB spinners. KL Rahul was stumped in an attempt to hit Chahal out of the park. 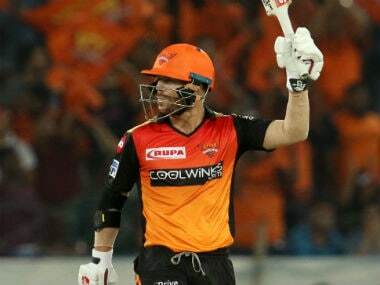 He then came back to trap a well-set Mayank Agarwal with a loopy leg-spinner, pitched on middle-leg stump line and going to hit the top of the off stump. 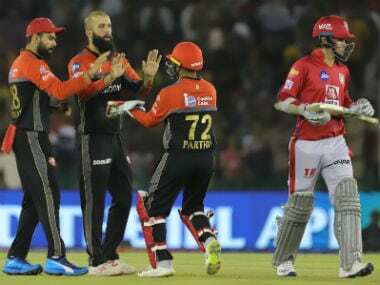 Continuing his inconsistent run in IPL for last 4 to 5 seasons, Sarfaraz Khan yet again could not control the adrenaline rush of pulling the short ball for a six. He ended up giving a catch to Parthiv Patel behind the stumps playing the pull, a ball later he hit a six off Siraj. Punjab’s lack of faith in Mandeep Singh yet again forced them to promote Sam Curran at No 5 and all that the England all-rounder could manage was a single digit score. As the wickets tumbled at the other end, Gayle did not have any choice but stay there till the end. 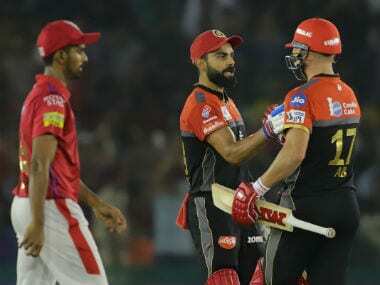 Ryan Harris, KXIP’s bowling coach, said that as the home side kept on losing wickets in the middle overs and with the wicket also holding up a little, it became hard for Gayle to get going. 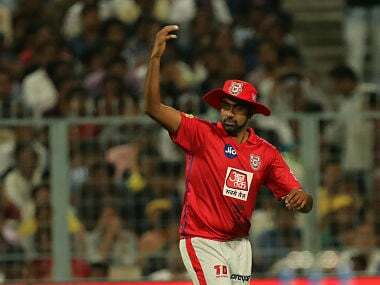 When asked to point out any grey area during the toss, KXIP captain Ravichandran Ashwin said that his team is doing well, adding that the side has defended the score when required and chased down big totals as well. While Ashwin may not like to speak about the negative points in public to keep the team motivated, it would be tough for him to not talk about it in the team meetings about the fragile middle-order. 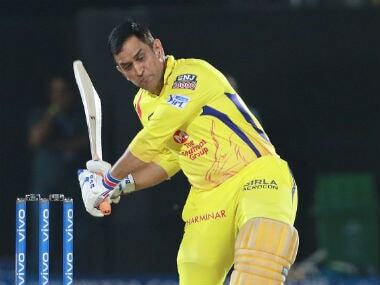 In the last two matches, both the Punjab openers have got 90-plus scores with Rahul even scoring a century, and on both the occasions, they have ended up on the losing side. On Saturday, Punjab were on course to a total around 200. They were 15 to 20 runs short on that pitch, admitted Harris later after the match. 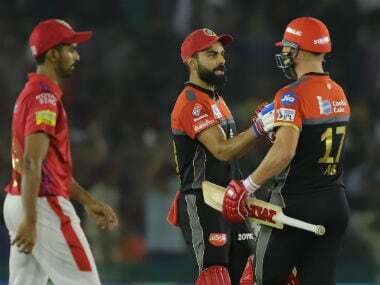 With RCB’s batting still revolving around Virat Kohli and AB de Villiers, they could have had a great chance to put more pressure on the short-on-confidence RCB with more runs on the board. However, with 174 as the target, RCB knew they were always in the game. The bigger boundaries in Mohali suited the Kohli style of batting, where he ran many singles and doubles. Punjab’s shabby effort in the field only helped the magnificent Kohli-de Villiers partnership to prosper. Kohli spent 73 minutes on the crease in this game, forming 85-run second-wicket stand with de Villiers. You cannot win a T20 match if you have let Kohli stay on the crease for that much amount of time, that too in a chase. Punjab’s bowlers, despite the below-par total, managed to take the match to the last over. It is an indication that the bowling department knows its job. It is the inconsistency of the middle-order that needs sorting out as the second half of the tournament commences.